About one-fifth of U.S. children over the age of 6 are obese. Childhood obesity often continues into adulthood, placing individuals at higher lifetime of risk for a number of obesity-related diseases such as diabetes, cardiovascular disease and some cancers. Reducing obesity in children may be the best way to improve the health of the next generation of adults, but this is one of the most challenging issues we face as researchers and health care providers. 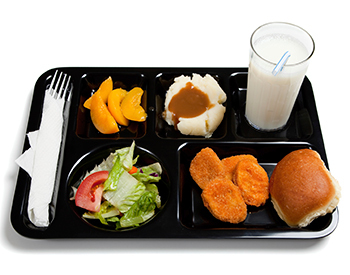 In contrast to adults, young children’s dietary choices are generally made by their caregivers and their schools’ food service providers. Unfortunately, school-based programs focused on healthy eating and physical activity have not been very successful in preventing or reducing childhood obesity. With generous funding from the Hillshire Brands Co., Rush has partnered with the UNO Charter School Network to help reduce childhood obesity through an innovative method. The Healthy School Meals Realized Through Technology (SMART) Schools program uses barcode scanning and touch-screen technology to track the food choices that students make at school meals. These food choices, and their nutritional value, are then summarized in a weekly report that is sent to caregivers. The reports also include tips aimed at helping caregivers guide their children toward healthy eating both at school and at home. Healthy SMART Schools has advantages over prior school-based interventions. First, we are finding that caregivers are engaged and involved, as they need to be. They have a powerful influence on children’s food choices at home, and in modeling a healthy lifestyle, so their involvement is so important. Second, the program provides actual data on what kids are eating at school and offers guidance on what they should be eating outside of school. This can help parents understand how food choices during school fit into each child’s overall diet, including what they eat before and after school. Finally, the program includes a classroom component that we hope will get kids excited about healthy eating. The program provides teachers with an overall summary of the food choices their class has made over the past month. This information can be used as the basis for educational activities, as well as fun competitions in which prizes are earned for healthy choices. We recently conducted a pilot test of Healthy SMART Schools with sixth graders at an UNO Charter School. The program was well-received, and we plan to conduct a second pilot test in a second UNO Charter School in the fall. This program has the potential to be adopted in schools throughout Chicago and across the country, without significant costs or the need to hire and train additional staff. We are also looking into combining the Healthy SMART Schools program with home-based childhood obesity treatment programs that we are developing. Brad Appelhans, PhD, is an associate professor in the Department of Preventive Medicine at Rush University Medical Center. In addition to conducting research on the causes and treatment of obesity, he provides behavioral weight management services in the Rush University Prevention Center.